The variables are organized in an abstract way, independently of the way they are persisted. the ‘cells’ are the variable entity values. A category describe some of the possible values of a variable. A category is associated to one and only one variable. A variable is in one and only one table. A table has several variables and is in one and only one datasource. A datasource has several tables. A datasource is not a database: it can be persisted in a database, using different schema. It can also be persisted in a file in xml or Excel formats. It is important to understand that Opal separates the formal description of the variables from the way they are persisted. This gives to Opal a lot of versatility. a value (required even if null). label en What is your age ? label fr Quel est votre age ? The fully qualified name is useful for disambiguation. define #Derived Variables that are to be resolved against ‘real’ ones. These virtual tables are then manipulated just like standard tables (for instance they can be copied to a datasource). Each entity has a unique identifier. An entity can have several value sets, but only one value set for a particular table. integer The string value must all be decimal digits, except that the first character may be an ASCII minus sign ‘-‘ to indicate a negative value. The resulting integer has radix 10 and the supported range is [-2 63, 2 63-1]. decimal As described by Java Double documentation. language: lowercase two-letter ISO-639 code. country: uppercase two-letter ISO-3166 code. variant: vendor specific code, see Java Locale. boolean True value if is equal, ignoring case, to the string “true”. Array of shapes. A shape is a list of points. The last point must be equal to the first point. 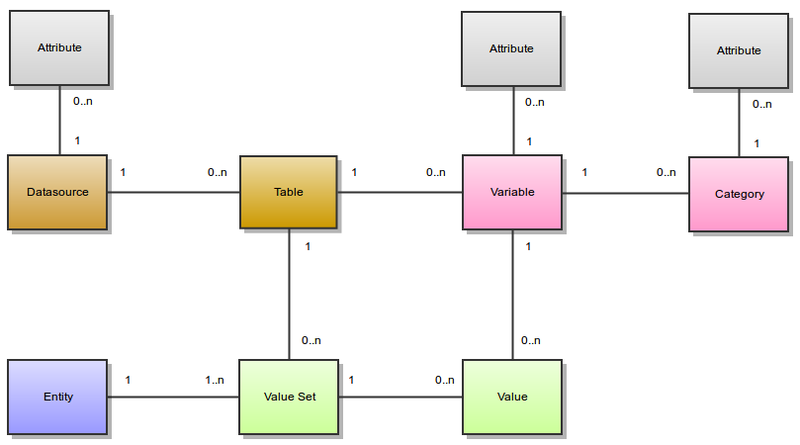 A value is associated to a variable and is part of a value set. Each value set is for a particular entity and a particular table. An entity has a maximum of one value set in one table. A value is always associated with a type and a data (or a sequence of data if the variable is repeatable).